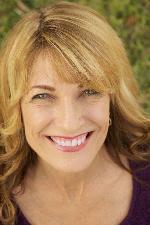 Gerrie is the Owner and Creative Director of Monologues4kids. Clients have successfully won movie roles, theater auditions, talent shows,and pageants and have secured professional representation using monologues written by Gerrie. Gerrie contributed original monologues to the book Active Listening by Michael Rost and J.J. Wilson. She is also the co-author of indie film "Perfect Pucker Lipstick" and has won several Marquee awards for Best Actress and Best Director. Gerrie teaches acting classes at the Cultural Park Theater and is the Theater Summer Camp Director. In addition, Gerrie serves as a judge for District 6 Thespian competitions and the Youth Theater Awards. We offer unique monologues that SHOWCASE your child or teen's talents and help them to be cast in the part, prepare your demo reel, or win the competition. FREE lengthening or shortening of any monologue, ensemble scene or commercial. Links to free monologues are also available. 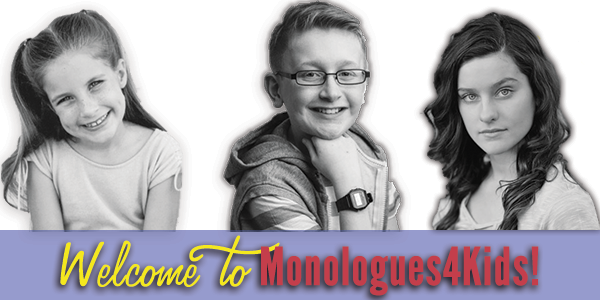 Own the moment with Monologues4kids! Introducing our new Challenged/Special Needs Monologues & Scenework for performers with developmental disabilities or physical limitations. M4K supports all Performing Kids! M4K has hundreds of monologues you can download immediately. Click on the link to see more in that category or click on our search button! Monologues are listed in suggested age order but if the list is too long and you would like monologue suggestions based on what your performing kid/teen is looking for, feel free to email us at monologues4kids@gmail.com. M4K is always happy to help. NEW MONOLOGUES Comedies: "Genie of the Lamp", "The Princess of Bees", "Livestreaming for Llamacorns", "Are you a Good Witch? ", "Practically Perfect", "Much Ado about Wooing". View comedies. 30 Second Monologues: "Bunnyhood", "The Dragon Confession", and "Let's Go Home, Toto". View 30 Second Monologues. Dramas: "Late Forever", "The Blue Room", and "The Sound of Happy". View Drama Monologues. NEW COMMERCIALS include "Universal Studios", "LOL Surprise Dolls", "Magic Unicorn", "Pomsies" and "Wizarding World of Harry Potter" View Commercials. NEW ENSEMBLE SCENES "Flower Power", "Barely a Scratch", "Callbacks", "Reindeer Rock Stars", "Calling Dr. Barbie", "Not a Trace" and "2:00 A.M.". View Ensemble Scenes. NEW ONE ACT PLAYS include "Deadly Invitation", "Picture Day", "The King Quest" and "The Duck Menagerie". View One Act Plays. NEW PUPPET SHOW "Rapunzel's Amazing Adventure". View Duet Acting including Puppet Show. M4K offers special discounts for Teachers, Drama Studios and Performing Arts Schools. Ask us today! MONOLOGUES4KIDS also offers custom Preschool programs, Puppet Shows, Introductions, Speeches, Pageant Performances & Workshop Requirements. Let M4K fulfill all your children's acting needs!